Do you want red wine or a dark beer with your cheese? I thought someone asked. I really did. As I look around, I realise it must have been my imagination, because I’m alone in the 16th century room. On show are two examples of how the platter would look like. The one made by Roman Reisinger, with a flakey old cheese, a loaf of fresh bread and a good glass of Chateau Ducru Beaucaillou looks exceptional. After my visit to the Reypenaer warehouse, though, I’d kill for a good Dutch cheese platter of well aged Reypenaer cheese. 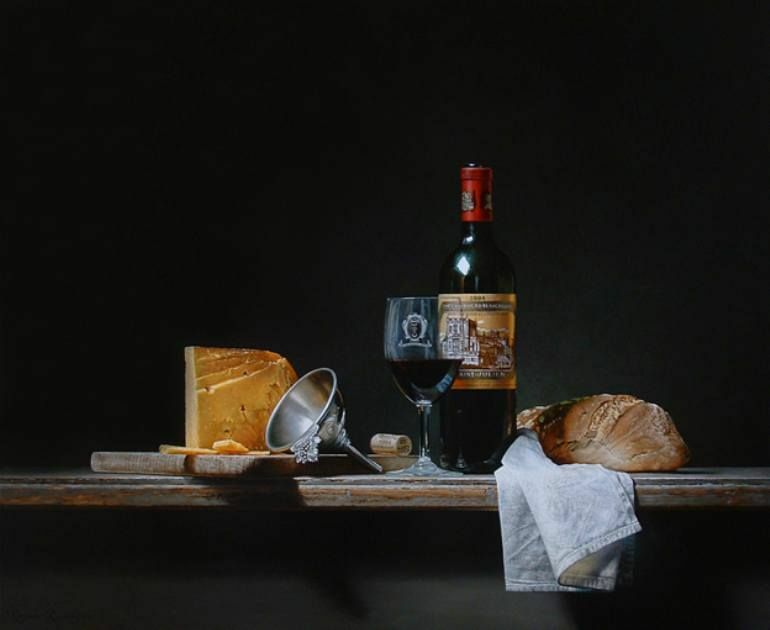 The creation of Marie Cécile Thijs is a true masterpiece; besides the spectacular light and great composition it’s in a small detail as the cheese board. The texture of the serving platter shows it’s frequently used and adds a typical Dutch old-time pub touch . In the neighbouring rooms breakfast is served. I can hear the children mutter a prayer while the bread is being cut. On the table are two chunks of cheese. One is a darkyellowish aged cheese, the other a feverish green coloured one. It looks like a breakfast scene from the 17th century. The family dressed in fine clothing, wearing jewelry is definitely well off, they can even afford meat. The person sitting at the long table hardly touched his breakfast. Some say he just left. * They might be right, just look at the slice of bread on the plate. It’s ready to be eaten! Ow, the plate is almost falling from the table…I run towards the table, just at the right time. Now that I’m close I see that it’s a similar Dutch cheese platter with a Gouda cheese and the feverish green cheese as on the neighbours’ table. I heard that in the past Leiden was not known for its cheese, but for its butter. The butter farmer made cheese from the milk that was so low in fat it hardly had any taste. The taste came from cumin, cloves, persil or horseradish. Gouda cheese, made from whole fat milk, was much tastier. In 1723 the government decided there should be a clear difference between the full fat Gouda and the low fat Leiden cheese. The cheese made from skimmed milk became flatter and got a H.K. (Hobbekaas) cheese stamp. At yet another table a man and woman are sitting at a table. They seem to be in a good conversation and in the middle of a meal. Or maybe already finished, there’s just a tiny piece of cheese left. The table cloth is rumpled and the knife is almost falling from the table. At the other table it was a plate, now it’s a knife. It almost seems they’ve deliberately been put on the edge of the table! In the other room a very sober table is set. No luxuruous Dutch cheese platter this time. Just a big chunk of cheese with quite a bit of cheese rind next to a wooden board with a slice of bread cut from a loaf. To the side is some butter. I know that when foreigners think of Dutch breakfast , they have this in mind. And it doesn’t matter, because so do I. As long as it tastes good – and there’s cheese involved- breakfast, lunch or dinner doesn’t have to be extensive! Enjoy your meal & make sure there’s a good Dutch cheese platter! The very informative – Dutch- booklet by Sephanie Rompa et all. that the enthusiastic team of Stadsmuseum Woerden gives you when you visit the exposition: “Onbeperkt Houdbaar, 400 jaar kaas in de kunst” which runs till 11 March 2018.